Material: Newly developed, aerodynamically optimized fibreglass shell in two sizes made from an extremely light yet very strong mix of materials. 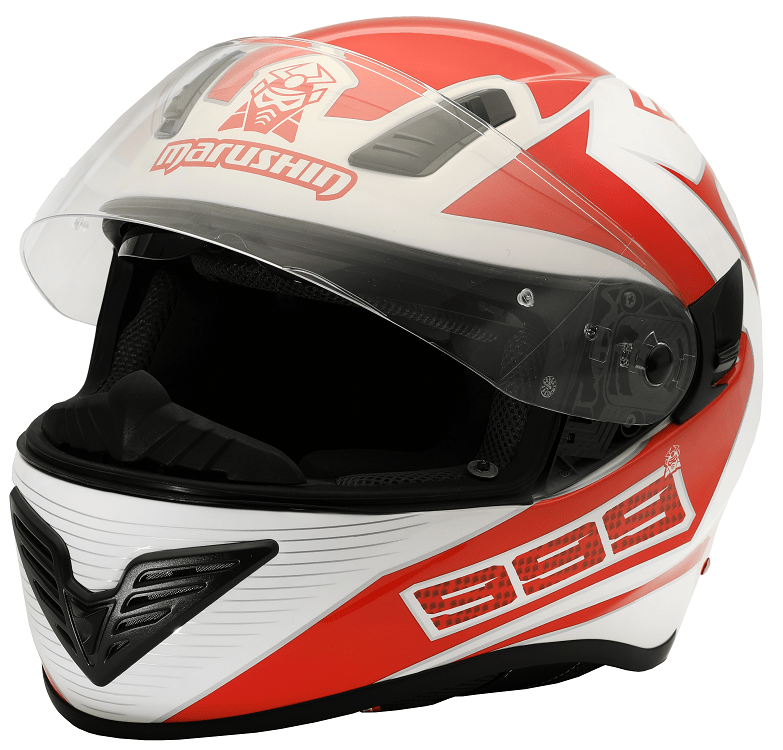 Ventilation: The completely overhauled and wind tunnel optimized ventilation allows even more air to flow into the helmet through multiple in- and outlets. Needless to say that all levers can easily be used with gloves on. Interior: The Marushin®-Cool inner liner with improved moisture absorption and faster drying for a pleasant wearing comfort effectively reduces bacteria build-up or odour formation. The cheek and centre pads can easily be removed and are washable. The newly developed cheek pads ensure perfect fitting even when travelling at high speed. Of course they are designed in a way that your glasses can easily be put on when wearing the helmet. Visor: Clear, anti-scratch, Pinlock®-prepared. Brand new internal sun visor, which has no negative effects on the safety of the helmet due to a perfectly adapted shock absorbing EPS liner. Lock: Micro-ratchet chin strap lock – all safety relevant parts are made of stainless steel. The abandonment of plastic parts grants maximum safety. At the same time it is easy to use and adjust. Highlights: Very light. Internal sun visor. Compact size of the helmet shell. Easy to use with glasses.